Plans are on to revive the 30-seater but experts see a tough and long road ahead for the passenger and cargo aircraft. When Russian Prime Minister Dmitry Medvedev called on Sukhoi to manufacturer a new regional jet, the aircraft-giant’s executives said it would be a better idea to revive the almost forgotten project of the Su-80, a 30-seat passenger and cargo jet. “We are ready to revive the Su-80 for Russia. We can build them at our plant in Komsomolsk. However, no one has amended the strategy of the civil aviation development yet,” Vice President for Finance of Sukhoi Civil Aircraft, Yevgeny Konkov told reporters. The Sukhoi official added that the authorities were not clear on what airfields the new jet should be operated on and what engine it should be equipped with. 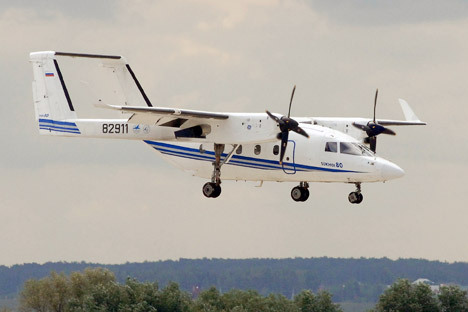 Konkov, however, believes that the government wants the company to manufacture a passenger transport aircraft for flights of 1,500 to 2,000 kilometres. The Su-80 program was closed a couple of years ago. According to Sukhoi’s website, the Su-80 is a multi-purpose mixed cargo aircraft designed to carry 30 passengers or cargo weighing up to 3,300 kg on commuter and regional air routes in any geographical setting, in daytime and at night, under favourable and adverse weather conditions. The aircraft was designed to replace the An-24, An-26 and Yak-40 planes. It is fitted with two ST7-9B turboprop engines developed by General Electric (USA). The cockpit is engineered for a two-member crew. The plane’s takeoff and landing performance and landing gear with low-pressure tires make it possible to use it on small airfields, including unpaved, ice and snow-covered runways. The Su-80’s hallmark is its fast convertibility, i.e., an option of quick reconfiguration from a passenger plane into a cargo carrier and back. The jet value varies from 230 to 280 million roubles in 2006 prices. On August 7, Russian Prime Minister Dmitry Medvedev held a meeting dedicated to the development of the regional aviation, at which he asked the Ministry of Industry and Trade and United Aircraft Corporation (UAC) to work on a new regional jet among other things in cooperation with foreign partners. One of the major reasons why regional aviation is on the decline in Russia is that the country has no modern and cheap jets. Stakeholders suggested that the redevelopment of the An-24, which has been the basic workhorse on the regional routes since the late 1940s, might be a solution to the existing problem. It is still unknown how officials react to the revival of the Su-80 project, as the Ministry of Industry and Trade refused to comment on the issue. However, UAC spokeswoman Olga Kayukova said that she had no information about Su-80 production plans. “This model isn’t in the line-up of the corporation,” she added. Sukhoi “forgot” about the Su-80 when it started the Superjet project, Aleksey Sinitsky, Editor of the Air Transport Review, said. “The project is interesting. Russia even tried to cooperate with Chinese. But the Su-80 is forgotten and no one knows how much it will cost to revive the jet,” Sinitsky said. In his opinion, the Su-80 might be revived as the government has decided to revive aviation projects. There will still be questions as to its price and after-sales maintenance. In addition, the future of the Superjet itself is an intricate problem. This regional passenger jet was designed in Russia at the turn of the century to replace Russian Tu-134 and Yak-42, which failed to meet modern requirements. When the Superjet was developed, many experts and professionals branded the project a potential saviour of the Russian aviation industry, which has not manufactured any new jets for a very long time. But the initial Superjet test runs revealed a handful of issues. In the Spring of 2011, the Superjet 100 undertook its first commercial passenger flight, on the Armavia route from Yerevan to Moscow, which showed engine-related problems. In May 2012, another SuperJet with passengers aboard crashed in Indonesia. Following that incident, Armavia cancelled its Superjet contracts. This was followed by more bad news for SuperJet with another aircraft making an emergency landing at Moscow’s Sheremetyevo Airport due to cabin decompression. Original publication can be read in Russian at RBC Daily website.